Hello! This is the last polish from the Hunger Games collection that I picked up. It's such a pretty green. I know it's not really a "spring" green, but still pretty! The picture of Agro was taken with my new camera! My fiance got it for me for my birthday! I was bad and he let me open it early. I wanted some practice before the get together on Sunday! And here is the bonus! 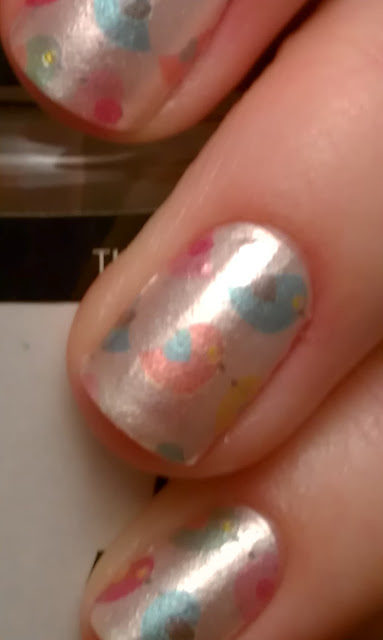 I wore Sally Hansen Salon Effects in Not A Peep for Easter. I was actually disappointed in these. The little peeps didn't stand out very much at all! Thank you!!! I was using my phone for a while, it was time for a good camera! Too bad about the peeps. I love Agro though! I know, I was sad! Thanks! I LOVE Agro and the peeps are so darn cute! Thats too bad about the peeps :( I heard from someone else too they were thin and not so good. I know, I was disappointed, there are lot's of other styles to try though!!! Agro looks great with your new camera. Happy early birthday!! Thank you so much! I know, I was disappointed, but there are lot's of others to try! Agro looks good. Congrats on your new camera and Happy early Bday! He's the best! Thanks! You should give it a try! I agree that the camera works really well! Thanks! I am super excited about it! you are doing well with the new camera right off the bat. I have to have someone look at mine. Nothing is going to the card - it will only go to the internal memory and that is full in a flash and a pain to hook up and pull off as that camera does not have bluetooth sadly. I am sick of buying good new dig. cameras and not have them last. Thanks! Mine is GE x500. So far so good. I didn't even have to do anything for the SD card, it just read it right off the bat. Hope you get yours working soon! Thanks! I still like to eat them every once and a while! It is good you didn't get them, would have been a waste and it's a shame. They are so cute! What camera did you end up getting? the pictures are really great! I'm waiting for someone to compare this with Peace On earth-I think they are dupes! I ended up with the GE x500. Thanks! I haven't heard of that one, so you will have to do fill me in when you find out! LOVE Agro! It's beyond beautiful! And while I understand why you'd be upset with the peeps, I actually really like how soft and small they are! Super cute! I love Agro too! They are super cute, just wanted a little more pop!